Have you noticed just how many foods at your local market are now labeled “natural”? According to a recent Consumer Reports survey, 73% of shoppers seek out labels with this term (despite the fact that there’s no FDA standard to define it). 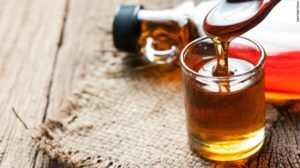 All of this means that artificial sweeteners and high fructose corn syrup are out — and a whole slew of natural alternatives have popped up in their place. Some are old-school favorites, like maple syrup; while others, like coconut sugar, are derived from familiar foods. 2. Honey – has been shown to possess small amounts of nutrients, antioxidants, and antibacterial, antiviral, and anti-inflammatory compounds. 3. Date sugar – Date sugar can replace white sugar in equal amounts, but using two-thirds also works well. 4. Coconut sugar – This sweetener contains inulin, a naturally-occurring, indigestible carbohydrate that acts as a prebiotic, or “food” for beneficial gut bacteria.